L’Assommoir is a stark, emotional story of one woman’s struggle to find happiness in working-class Paris. 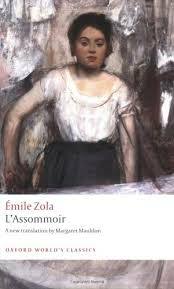 The seventh title in Émile Zola’s 20-novel cycle about the Rougon-Macquart families, it ultimately cemented Zola’s position as a leading European author although at the time of its publication in 1877 it was hugely controversial. French conservatives, sensitive to the political implications of the novel, accused Zola of grossly exaggerating the fetid, crowded, unsanitary conditions inhabited by his characters. Zola insisted that his depiction was authentic. It was, he said ‘the first novel about the common people that does not lie’, because it was based not only on his own detailed observations of the lives of the working class but on extensive research of medical texts on the effects of alcoholism. Zola said his purpose in writing the novel was to show how the fate of the individual is governed by hereditary and environmental forces outside his control. No matter how hard they try, they cannot escape the moral flaws passed down through the generations and the dehumanising effects of the slum conditions that were the product of rapid industrialisation. His main focus in L’Assommoir is Gervaise Macquart, a laundry worker treated brutally by her lover Lantier and then deserted by him, leaving her and her two children destitute. Eventually she finds a new life with the roofer Coupeau, gives birth to a daughter Nana and begins to dream of owning her own laundry. A loan from a neighbour who is secretly in love with her enables to achieve her ambition. Through determination and hard graft, she makes it a success. Fate of course has something other than happiness in store for her. Copeau lets his attention slip one day and falls from the roof. Though he survives, he is disabled. No longer able to resume physical work he spends his days drinking rot gut at L’Assommoir bar. Gervaise’s desire for the good things in life lead her to overspend and from there into a cycle of debt, squalor and despair from which there seems no way out. To be able to get on with her work, always have something to eat and a half-decent place to sleep, bring up her children properly, not be beaten, and die in her own bed. Instead she ends up sleeping in filth in a courtyard that feels like a cemetery, starving battered by her husband and alone, her daughter having become a prostitute. Although we as readers keep hoping against hope that she will gain happiness, there is a sense of inevitability that this will never be the case given Zola’s view of the world. His main characters have, like the great tragic heroes, a fatal flaw. A tainted inheritance is repeatedly invoked as a factor that loads the dice against he characters efforts to avoid a virtually preordained degeneration. Copeau becomes an alcoholic just as his father did, and also like him, suffers a similar accident. Gervaise, abused by her partners just as her mother was, has a physical defect also in the form of a limp. Weakened by their inherited flaws, these figures are powerless against the forces of the poisonous atmosphere of their slum neighbourhood. Intoxication and idleness lead to a weakening of family ties, to the filth of promiscuity, toe the progressive neglect of decent feelings and ultimately to degradation and death. My characters are not bad, they are only ignorant and ruined by the conditions of sweated toil and poverty in which they live. Pessimistic yes. Grim, assuredly. But it’s in Zola’s ability to force us to confront the reality of life at a particular moment in time as seen through one woman’s experience, that the enduring power of this novel lies. Gervaise (1956) adapted from L’Assomoir.